Tennessee’s Touchstone Energy Cooperatives will be sponsoring the Chapel Hill Lion’s Club Super Pull of the South on Friday and Saturday, July 22 and 23. “We are excited about the platform that this event provides us to tell the story of Tennessee’s Touchstone Energy Cooperatives,” says Trent Scott, vice president of corporate strategy for the Tennessee Electric Cooperative Association. “The partnerships between Touchstone Energy, participating co-ops and TECA allow us to have a presence and reach our members in ways that no single co-op can.” All 10 Touchstone Energy cooperatives in Tennessee are participating in this year’s event. 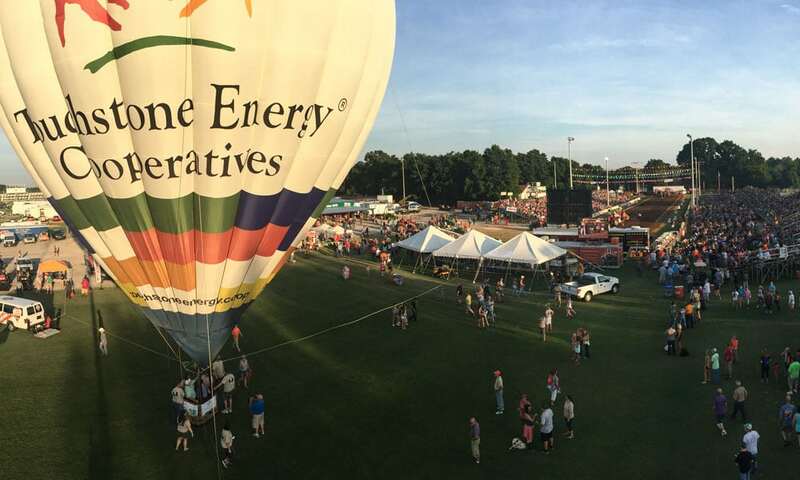 The Touchstone Energy hot air balloon team will be giving tethered rides and lifting the American flag over the stands each night during the opening ceremony. Co-op members visiting the Touchstone Energy booth will learn about electric safety and quick and effective ways to save energy. “We are pleased to have TVA joining us this year,” says Scott. “We will be telling members about the eScore program and handing out caulk, LED light bulbs and receptacle gaskets.” Members will also have the opportunity to win a riding lawn mower and other prizes. Co-op members attending the event are encouraged to visit the Touchstone Energy Cooperatives of Tennessee booth just outside the entrance to the stands. Touchstone Energy On Tour visited the event in 2015, and the footage they filmed became a part of their latest national advertising campaign.